81-year-old man presents with pigmented lesion on left neck. The lesion was excised with 2 mm margins. BCC was found with clear margins. Pigmented basal cell carcinoma of the neck. Pigmented basal cell carcinoma is an uncommon variant of the common skin cancer. Its behavior is that of a non-pigmented basal cell carcinoma. It can be confused with melanoma and pigmented seborrheic keratosis. 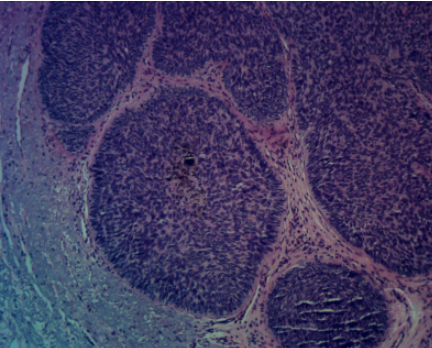 Dispersed pigment within stroma of the cancer cells is visible.